Innovative and unique cat balls that rattle, roll, and move like real prey. These cat toys are scented with a proprietary blend of cat attractants and have been cat-tested and approved by serious cat lovers. Designed by veterinary professionals and handmade right here in the USA. Product Details: Standard-sized ping pong balls with tails between 6-8 in. Colors vary according to stock. 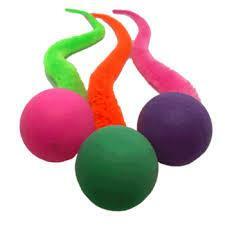 Difference between Wiggly Pong and Wiggly Ball is that the Wiggly Pong rattles. Wiggly Ball bounces. Innovative and unique cat balls that rattle, roll, and move like real prey. These cat toys are scented with a proprietary blend of cat attractants and have been cat-tested and approved by serious cat lovers. Designed by veterinary professionals and handmade right here in the USA. Product Details: Standard-sized ping pong balls with tails between 6-8 in. Colors vary according to stock.